In historic times, weirs were built to channel water to now-redundant mills. They have been barriers to migrating fish, seeking their spawning grounds. See our videos of the problem on the videos page. 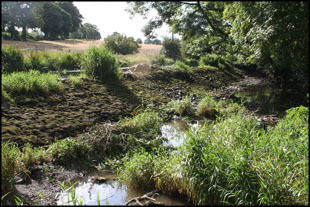 The Trust, with the help of the Fisheries Board and National Parks and Wildlife, has undertaken to invest in fish passage projects on some of the most problematical weirs. The Trust has recently completed a rock ramp at Boland's Mill on the King's River, generously funded by Kilkenny Anglers Association. We have also recently completed another project at Bradley's Weir on the Kings River.